The Next Web Canada is a media sponsor for the Social Intranet Summit next week, so I will of course be in attendance. I’m going because I’ve known about the Thought Farmer folks for several years now and I happen to be pretty interested in the space. I cut my teeth on a lot of collaboration/work hacks/life hacks stuff on Intranet-Extranet projects. You might not think intranets are cool anymore, but honestly they are pretty essential not for how business need to work. Okay, my preference is for a collaborative extranet cause I prefer to telework, but I digress. #1. Intranet experts. Brian Edwards, Bevin Hernandez, Dion Hinchcliffe, Andy Jankowski, Stewart Mader, Dan Pontefract, Bert Sandie, and many more. #2. Case studies. Hear about the social intranets of Continuum, Oxfam America, and Penn State University. #3. Great conversations. Network with people like yourself, facing similar challenges with intranets and collaboration. #4. Build your business case. Learn about ROI, KPIs and RFPs. #5. SharePoint 2010. Hear how EA, TELUS and Servus Credit Union are using SharePoint 2010. #6. ThoughtFarmer 4.0. Be among the first to see ThoughtFarmer 4.0 as it’s unveiled to the world on October 28th. #7. Pre-event workshop. Using ThoughtFarmer? The workshop on Wednesday, October 27th will help you take your ThoughtFarmer social intranet to the next level. #8. Vancouver. Haven’t you always wanted to come to Vancouver? Of the world’s coolest cities, Vancouver has to be in the top 5. And if you already live here, when was the last time a great intranet conference came to Vancouver? Like… never? #9. 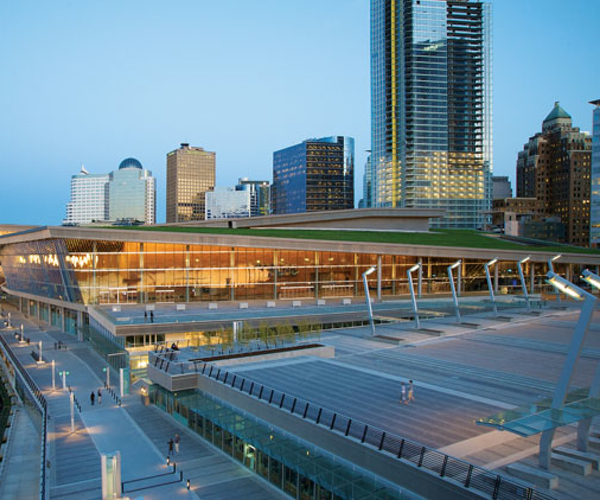 Vancouver Convention Centre. The venue is killer — brand new, immaculately designed and right on the water! Have a look. #10. Food’s on us! Vancouver has great food, and it’s on us! Enjoy morning snacks, lunch and evening appetizers and libations, hosted by ThoughtFarmer. via Top 10 Reasons to Come to the Social Intranet Summit – Intranet Blog – ThoughtFarmer. I’ll even sweeten the deal for you…if you register and use the coupon code NEXTWEB you get $100 off the registration price. People don’t often get together to talk about intranets. Maybe because folks think they are passé in a world with Twitter and Facebook, but I think a strong intranet can help make those tools more useful to your employees. Here at TNW we use (essentially) an extranet to collaborate, organize, and share info. Just today we were coordinating who would post what when and sharing breaking news (especially if it was important, but the person who found it couldn’t cover it). Now, if you’re a large organization, imagine how well things could work if people had a nice, simple way to do the same thing? Imagine … a better intranet. Okay, that’s getting a more than a little sappy, but the point is that with HTML 5 and new browsers there is a lot more that can be done with an Intranet than we could before. So, I hope I see you next week, even if you want to just pick my brain at how an Intranet should work.